... says that at least one third of the people we know are introverts. "They are the ones who prefer listening to speaking, reading to partying; who innovate and create but dislike self-promotion; who favor working on their own over brainstorming in teams." She discusses the appearance, or at least the rise in the twentieth century of what she calls the "Extrovert Ideal - the omnipresent belief that the ideal self is gregarious, alpha, and comfortable in the spotlight." "Introversion - along with its cousins sensitivity, seriousness, and shyness - is now a second-class personality trait, somewhere between a disappointment and a pathology." 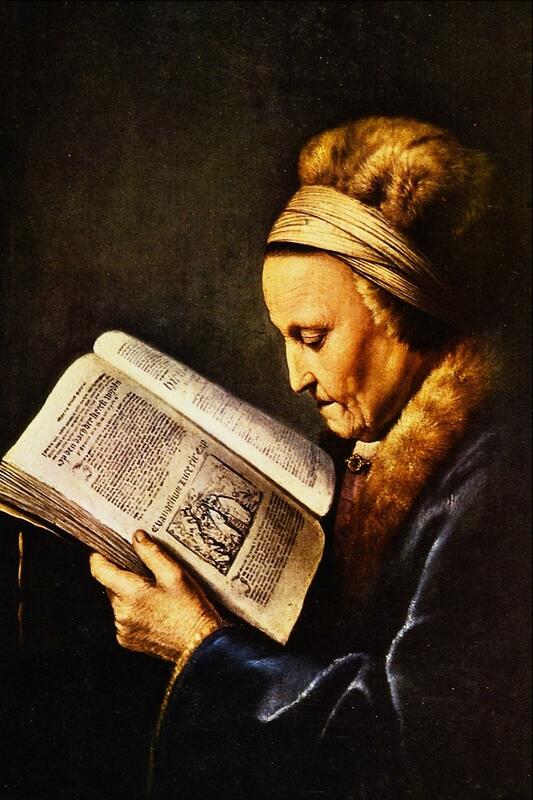 ________Painting from Biblioklept: Old Woman Reading, by Gerrit Dou. I read that book. I really thought it was interesting. But I sometimes think more than 1/3 are introverts, just some of us are more painfully introverted than others. Isn't this a wonderful book? I'm what I call an "adapted introvert": over years of doing jobs that require forcefulness (social work management...) I learnt how to act as tho I were extrovert. On retiring from the job, it is delightful to resign that aspect of me as well. To be still, to be quiet. To speak when I have (possibly) something worth saying - and, otherwise, to shut UP. Have you seen the Susan Cain's "TEDtalks" video on YouTube? It is lovely - one of the best of the TEDtalks as far as I am concerned. Do any other introverts find it much easier to communicate through written mediums? I love Gerrit Dou's work--I used to do research on him. Thanks for reminding me of his art. Great comments. I didn't know about her TED talk. Will take you recommendation, Margarita. She mentions that about writing, shaun. "At school, you might have been prodded to "come out of your shell." "Or you're told you're "in your head too much." "As adults, many of us work for organizations that insist we work in teams, in offices without walls, for supervisors who value "people skills" above all. To advance our careers, we're expected to promote ourselves unabashedly."